Went to Mendenhall glacier and they whale watching, saw five whales and then to orca point lodge. Three parts to "The Best of Juneau". This was the biggest city we stopped at and it had a lot to do/see. The Mendenhall Glacier Park stop was not long enough to hike some of the wonderful trails. Too much time at the hatchery with realy not much to see. A very enjoyable trip. Got to see some eagles, bears, sea lions and whales. Had a nice salmon bake lunch and saw the Mendenhall Glacier. 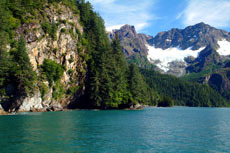 This "Best of Juneau" included the Whale watching and Mendenhall Glacier. I booked with the lunch. You end up taking 3 different buses for each segment of the tour. Booked the tour with a local at their company kiosk on the pier. Booked the tour with a local at their company kiosk on the pier. toured the City and then out to Mendenhall Glacier. Could have used a little more time out there. Beautiful. Started off on the bus with excellent, informative and entertaining driver - Sam "the Man". This was a three part tour: Glacier, City Tour and Whale Watching. Saw several humpback whales, and numerous sea lions. Saw lots of whales. The salmon bake was tasty on a beautiful island. Mendenhall Glacier is breathtaking. We got to see many whales but they were a distance away. We got to see many whales but they were a distance away. The crew on the whale watching boat were great. We really enjoyed the Mendenhall Glacier as well. There were a lot of people on this tour, but there was plenty of space and many opportunities to see humpback whales, sea lions, seals, and eagles. The salmon bake was one of the most delicious meals we have ever had on an excursion. 2.5 hour whale watching boat ride. We loved our tour guide, Cordova- very knowledgeable. We loved our tour guide, Cordova- very knowledgeable. Enjoyed the trip out to Mendenhall Glacier & the hike to see the falls.